GOJIRA frontman Joseph "Joe" Duplantier has told BBC Radio 1's "Rock Show With Daniel P. Carter" that he couldn't get into SLAYER's music when he was initially exposed to it. "I remember the first time I heard [SLAYER], it was too much for me — it was too fast, too evil… it was too everything; it was too much," he explained. "And I was very intrigued by it. I'm, like, 'Why is it too much?' It's so evil — the notes, the tones, the playing, the drums, the solos, the vocals. There's something hard to explain about SLAYER that makes it so evil. "So I came back to SLAYER years later," he continued. "When I was 18, 19, I was, like, 'Yeah!' My teenage years, being into METALLICA, I was then into death metal. And then I was ready for SLAYER — to go back and listen to SLAYER. 'South Of Heaven' was a big thing for me." 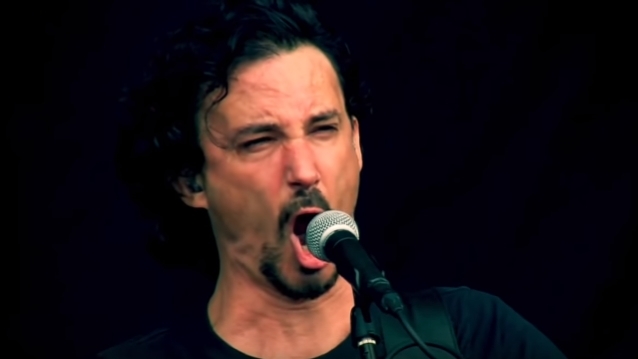 GOJIRA toured with SLAYER in 2013, and Duplantier told SPIN that the experience was "amazing." "I learned a lot from [SLAYER frontman] Tom [Araya]," he said. "I'm very impressed by his charisma and how he communicates — he doesn't care, he is just himself onstage. He doesn't need to play hard to be metal. He doesn't need to try. He can just be himself. He's not scared to talk about love — for example, several times during the shows, he talked about a SLAYER show being all about love." Duplantier also revealed that "South Of Heaven" was the first SLAYER album he ever listened to. "I was in high school at the time and I had to take the damn bus every morning," he said. "Listening to this album, it's so evil and dark, punk and thrash at the same time. It was very helpful for me to face the day. Going to school was torture for me, and listening to SLAYER at this moment was very helpful." This past January, SLAYER announced that it would do one last concert tour around the globe to thank its fans for all of their support over the years. In August, Duplantier confirmed to Metal Injection that GOJIRA has commenced the songwriting process for the follow-up to 2016's "Magma" album. "Magma" earned GOJIRA its first-ever Grammy nominations for "Best Metal Performance" and "Best Rock Album." GOJIRA's crushing track "Silvera" received a nomination for "Best Metal Performance", while "Magma" was nominated for "Best Rock Album" at the awards.